We’re going to go way back for this one. Once upon a time…is how I ended a lot of my days as a kid. My sister and I would snuggle into our beds and pull our covers up to our chins. Then, sometimes we would have to barter (just one! Pleeeease!) and sometimes we would be given stories freely. Once they started, we had to struggle against the weight of our eyelids to stay awake, but we did our best. We usually had to be briefed about what happened the night before in the book because we had fallen asleep, but we always enjoyed being read to. Fast forward to some odd decade when we are two grown adults and are decidedly not sleeping in the same room or being read to anymore. My sister has turned to the dark side, (math) but she enjoys the occasional book. And then there’s me, who will quite literally read anything if it stands still long enough. Not counting the books he read to my sister and me, he had only completed a few titles in his entire lifetime. One was a morbid tale about a few hikers who had to go all Dommer on each other at the end of their trip in to the cold tundra. They all had German names so my father, the resourceful man that he is, simply renamed them all with nicknames he could pronounce. (I imagine it was like reading Crime and Punishment by Dostoyevsky. Thankfully, this wasn’t a story he read to us.) But lucky for my Dad, every book nowadays is being made into a movie. So, no reading required. And lucky for me, every book nowadays is being made into a movie. So, all the reading required. Fast forward a little farther, interestingly enough, when I was jumping onto the Hunger Games bandwagon in another country, my Dad was enjoying the movie back in the States. When I returned, we talked about our love for the franchise. I told him how great the book was, he told me how great the movie was. And as a result, he picked up the book, and I watched the movie (again). It was supposed to be a friendly, enjoyable way to spend some time together. Then, we made a bet. I bet him that he couldn’t finish the third installment of the Hunger Games before the movie came out. (That was almost a year ago). He had more than a few months to complete my challenge. If he did, I would take him to the movie and buy him dinner. I thought I had this one in the bag. He hadn’t read a book in years! Not only did he finish Mockingjay. He finished the entire Divergent series and The Giver. The best part? He loved them. He loves the entire dystopian genre. He is now so excited to see the Mockingjay movie. In fact, he’s about as excited as me. We just bought our tickets today. So, in the end, even though I lost the bet, I actually won. I finally have someone to discuss the books with, to share my passion with. 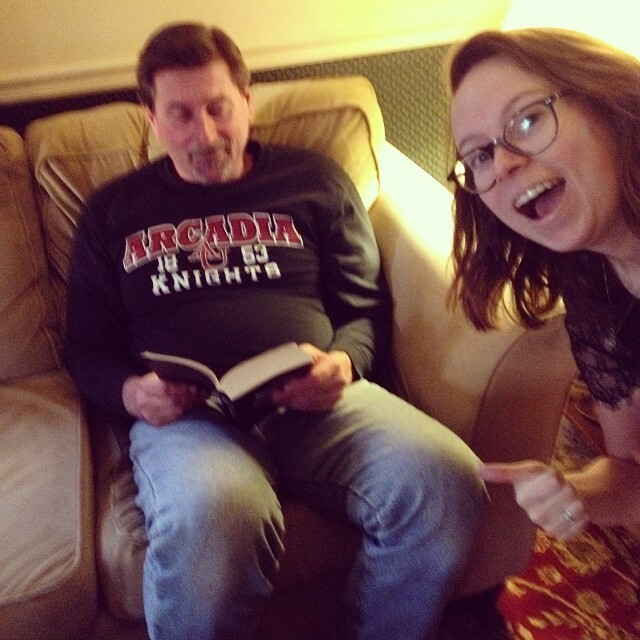 But more than that, I got my dad to do something truly amazing: read. I am an incredibly proud daughter. And I am so glad that we can still share the joys of reading together as we once did. This is actually him finishing Mockingjay and me…being proud.